You’ve no doubt heard about how important finding a comfortable mattress is for clocking quality sleep, but it’s also key to invest in the right pillow. An ill-fitting pillow is not only a sleep thief that keeps you from waking up feeling truly refreshed, but it can also trigger or worsen headaches, neck pain, and arm numbness. Combine all of that with the premature aging that can happen with repeated pressure of your face against the pillow and you might want to think about revolutionizing your sleep with an enVy therapeutic neck support pillow. 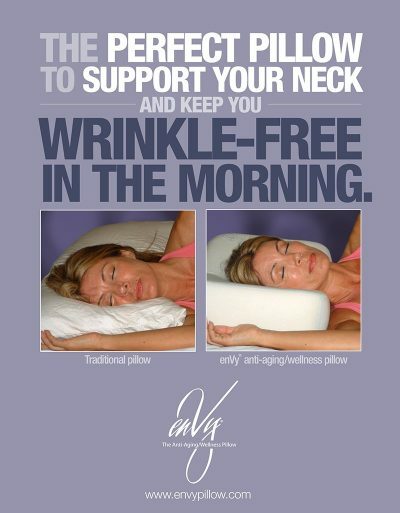 With their anti-aging, OFF-Your-Face patented design, enVy pillows support your neck, shoulder and back alignment.Full size and travel sizes available (as you won’t want to sleep without it). You can experience an #enVypillow for yourself – we have them on our treatment beds to help our guest achieve the ultimate in relaxation. Pop in and see us to give them a try.